All this and the theme of the “entrapment” of enlightenment or religion. I am using the basis of “capture”, the structure of a net form. These “nets” relate back to 2001 and my tapestry entitled “Sea Symphony” in which I used them to dissipate the colours, to trap or snare the idea, the concepts and the human spirit. In essence it is a series of holes linked together by a flexible cord which can be elongated, extended and given shape as well as containing and capturing an inanimate or animate form. The sweeping forms begin and extend from the curvature of the earth within the background of billowing clouds. The realm of the unknown, signified by the colour black, follows through the net forms which in turn hold the known physical worlds in which we live. Sweeping on upwards towards the “golden globe”, which is the Sun, whose colour signifies “enlightenment” or “religion” which is so important in the Hindu way of thinking. There are also the colours of the earth, of air, of fire and of water within the net’s mesh structure. This fifth element, is sought by all Hindus and even a life time of devotion, study and thought is considered barely sufficient, perhaps it is unattainable? Who was it who questioned that the journey should be considered more important than the arrival? This question as to how we cross the bridge from our physical world to the spiritual world has challenged philosophers and thinkers over thousands of years on all continents. It is the story of the transition from “incompleteness” to a sense of and understanding of “fulfilment”. The diverse variety of temples, cathedrals, stone structures, and basilicas, the known and unknown stone, wood and earth works and circles indicate that this is a world-wide phenomenon. The Sarsen stones of the great “Henges” are considered to be the result of whole communities coming together to experience communally the selection and positioning of these huge monolithic stones. It had to be a large scale effort by entire communities due to the scale, size and weight and would have taken months if not years. From the extraction from a chosen quarry location to their final resting place could have been many miles distant. It might be that they, in some way, are viewed as a source of life, ongoing and representative of their forefathers into the present person or family group or tribe and as a means of looking into the future. What is certain is that undertaking these actions and building these special places are symbolic and important memorable events. The stones possible selected from the home location of a community were hewn from the bedrock, dragged, floated and rolled by the ingenuity of man and his labours. A hole was excavated on the chosen site and the stone tilted and erected upright. The impact on the people involved must have been profound. These events coming long before religion, as we know it, was created, would have helped to create links with other communities thus generating a larger grouping. The hole made and the placing of the stone deep into the earth could have been seen as a link with their forefathers and of people who had gone before. It may well have been seen as a bridge between the unborn, the living and the dead. The ceremony of final placing was now in the present and the standing stone looking ever upwards denotes the concern, the anticipation and the interest in the future. All this must be seen as conjecture and interpretation, based on current archaeology and thinking but the arrival at this standpoint is miniscule when compared with the long journey of travelling searching for a reason or explanation. But what a journey, where all life’s experiences can be borne in mind, it is a labyrinth or maze whose centre is unattainable. I am reminded of the great maze in Chartres Cathedral with its constant turning and rotating pathway leading ultimately to its centre. A journey through life and similar the “river of life”? The design for this tapestry contains much symbolism and many of the ideas and concepts I have been working with for a number of years. The background is the world above the clouds, the ground below is invisible. It is neither the physical nor the spiritual world. From beneath we can see the barrier of the blossoming cloud formations occasionally giving a glimpse of the clear sky above. The darkening clouds welling upwards ultimately give way to the light and with it some understanding, the Moon is visible. The vision of the Moon is playing and important role. Although we are always aware of the Sun, whose shape never changes from the golden globe, a perfect sphere. It is the Moon which is continually changing its shape and does so throughout the year on a monthly cycle. Its influences are paramount on the weather and tides, man looks forwards to the cycles of waxing and waning and with them the changes of moods, activities and the effects on the human spirit. The many ovoid shapes reflect the eroded pebbles, shaped by the water from misshaped jagged rocks, and are emblematic of time past. Where eons of time have produced smooth, curved rounded forms. A perspective has been achieved by the sweeping curves of the foreground leading to the completed forms before leaping upwards to the “high places” and beyond. This implies man’s soaring aspirations is never ending but still he is mindful of his past. His family, friends, experiences and places he has visited. All have a role in his personal identity. Sweeping upwards, from the black darkness of the past he gradually begins to see light and his future. The colour palette is descriptive of the developing personality, each pebble a window through to a specific place or experience and always in the company of a person. It is so much more intense, enjoyable and valuable an experience if shared. These are “aide memoires” to remember that moment in time, that place and that person. With the Moon barely visible, her impact is still poignant made more by the ever changing shape of her form. Perhaps she is the “trigger”, the initial impact that prompts our thoughts in a particular and pertinent manner. 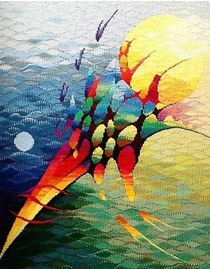 There are many links and similarities in the design of this tapestry with the previous piece. (See the Nepal Series) The movement is a sweeping upwards curve from the left hand side, coming from the darker areas above the clouds. Again there is no visible sign of the earth below yet high above there is light and that tantalising glimpse of the Moon. The drama comes from the darker unknown through the transition to the brilliant light of the golden sphere and of enlightenment. I have used the concept of a “net” to illustrate the capture of understanding, this is a gradual process for we can see through the net’s mesh the variety of experiences which include all of the five elements. The verdant greens and browns of the earth, the sky blues of the air, the orange and reds of fire and liquid blue of the movement of water. The fifth element, evident in some religions, is displayed by the yellows, oranges and golds depicting “enlightenment” sometimes called “religion”. The search for this understanding and meaning occupies a lifetime, it is ongoing and never ending. The challenge is to traverse from the feeling of “incompleteness” through the transition to “fulfilment”. This encompasses all aspects of life and its multitude and wide variety of experiences, all of which play a role in furthering this objective. Naturally there are both positive and negative elements to contend with. The dark outline of the mesh’s cords are indicative of this and also of the unknown which will occur throughout a life’s span. The curving horizon which frames the rising yellow and gold light, denoting a new dawn, or dusk gradually gives way to the colours of the experience. These rounded mesh shapes, separate but together act as windows of known previous moments in time. Surrounded as they are with the dark unknown, its links help to create a feeling of looking and seeking of what lies ahead in the future. There is added hope and anticipation, and other important human emotions play their part in unifying these singular elements into its cohesive aims and objectives.